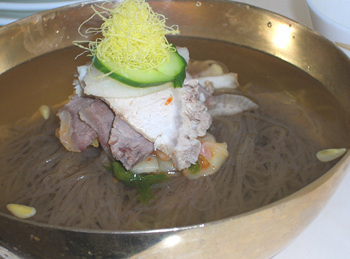 Learn about north Korean cold noodles! I got an interesting email from one of my readers, Paul, the other day. It was about his food experience in Pyongyang. So naturally it drew my attention as I’ve never been to North Korea before. Have you? His description about the north Korean cold noodles – Raengmyun (south Korean naengmyun, 냉면) he had was quite descriptive and he also kindly attached some photos for us to share. 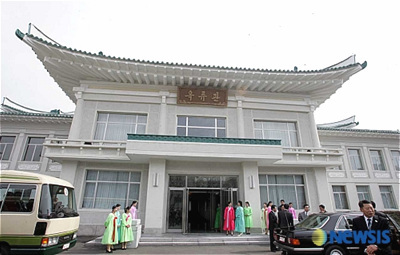 The restaurant he visited is called “Okryugwan (옥류관) “, one of the landmarks in North Korea, and is located near Daedong river. North Korean food is generally known to have a purer and clearer taste than South Korean food. If you are used to the artificial taste of some other food, it might taste quite bland. Here are some photos of what Paul had and his description about them. Thanks, Paul for sharing your experience with us! The noodles arrived extremely cold and contained a chewy texture. The buckwheat hulls would separate and offered great texture contrast while chewing. The broth was very mild, not salty nor “meaty” flavored but pure and clean. 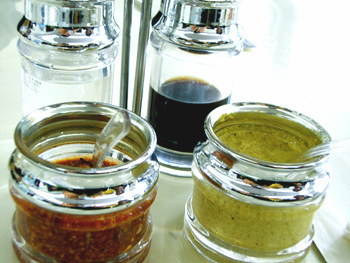 The mustard and hot pepper condiments are house made. The mustard packed a great punch, but just enough so the noodles natural flavor came through. The red pepper sauce is a winner and combined both sweet and aromatics, one of the best in my memory. Finally vinegar, was just that, white vinegar most likely vegetable as the smell was quite mild. The many kimchi varieties in Pyongyang tasted to be quite sweet and mild and did not contain heavy amounts of garlic. I learned that this is a Pyongyang characteristic with Kimchi. Truly an eye-opening experience! If you would like to make some Korean cold noodles at home, try these recipes! Very historical place and a variety of traditional food. I’ve tried this before and I love the ambiance, the service and the food. Very good. Thank you for this post! I have been eating what my mother just called “Cold Soup” all my life and now my daughter loves it, too. It’s sometimes difficult for me to find since the packaging doesn’t call it Cold Soup. LOL. Now I know it is really called Raengmyun!! 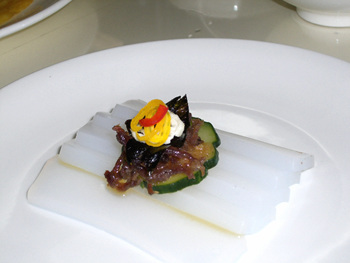 The food looks quite elegant and delicate compared to South Korean cuisine. It is definitely more old world and traditional looking. I do think South Korean food looks more delicious though. Thanks for posting this with the pics and all, I have never seen pictures of food from there. It’s not what I expected, I guess I thought it would be more peasant like. I wonder what the average North Korean diet looks like though. regarding the food, i wonder if this is the nk word for naengmyung? i know sometimes the r and the n sound get switched… for example, my last name is roh, pronounced noh in s.korea, so i always thought it was some weird translation issue. however, i recently found out that it’s pronounced with the ã„¹ in north korea though! so maybe…? 전 김치나 된장 같은 건 좋아하지만 (특히 김치볶음밥(Kimchi Fried Rice) 같은거).. I thought that last dish is actually mook, no? Actually, N. Korean food and S. Korean food aren’t very different at all. Both North and South eat the same dishes, except in the North, they are short on food. Of course, they feed visitors (ie: foreigners) very well, but I know for a fact that people there are starving. Two family friends are actually doing a project involving China and Russia to grow food on their land in order to provide more food for North Korea. Also, I have to admit that N. Korean food consists of largely traditional dishes, while in S. Korea there are traditional Korean dishes, as well as Chinese, Japanese, Western, etc… dishes. I’ve just finished the Dae Jang Geum TV serial and am trying to find out more about Korean cooking, so it’s interesting stumbling across your site. Keep up blogging, you’re doing great. Update, please! This blog has been really good so far; I’d hate to see it abandoned! This is the first time I came across this blog.. how wonderful!!!! 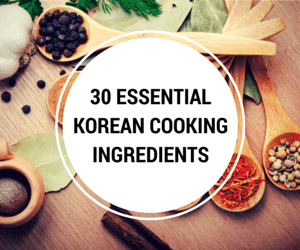 I just love Korean food but never seem to get the recipes for these more authentic foods. Thank you Keep up the good work!!! How interesting! I’d love to visit Korea someday. Your descriptions give me appreciative remarks over cultures. Sounds lovely to be there. I always have a dream to wear your costumes. They’re beautiful. 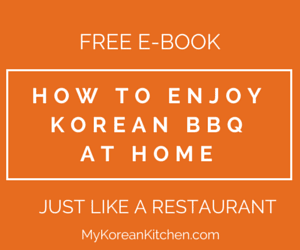 I stumbled across your website as I was searching for a good website with Korean recipes. How surprised (and pleased) I was to find this site! I am living in Korea and engaged to a Korean man. So far I have been relying on a couple of terrible recipe books, my fiance’s mother and common sense to throw together some Korean dishes. So far the other half really loves what I cook, but this site allows me to add variety to what we eat. 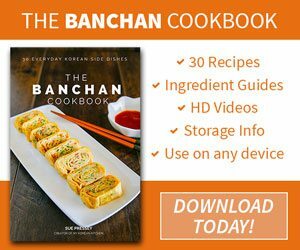 I think it’s about time that a really practical website (and recipe book) about Korean food became available. I have put a link to your website on mine, but if you want I will take it off. If you want me to take it off just leave a message on my website. Also…who is taking the photographs? They are fantastic! What’s the stuff on top-mountain ginseng(ì‚°ì‚¼)? Mmmm. . .That looks so good. I went to a restaurant once in Jeonju that supposedly served authentic North Korean cuisine. I had nangmyun, but never having been to North Korea, I obviously am not sure how close to the real thing it was. It was delicious though. nice blog! appreciate your passion for korean food. ever since I came back to korea, i’ve been really appreciating the flavors of this country. will you keep on going with this blog even if you don’t live in the country? i’ll definitely come back. Yay a post! (Post more!!! Haha. Okay you’re probably busy). This looks interesting… What was he in N Korea for? I kinda want to go myself just to see what it’s like. What a rare but interesting chance to check out N. Korea! Thanks for sharing!